Free Social Buttons Plugin and Blog Earning Opportunity.Sharexy.com | AdsWiki - Ad Network Listing, Reviews, Payment Proof & Advertising News. I have found a social sharing plugin, which can help you monetize your blog. Sharexy pluginSharexy.com is a new blog advertising network with a new approach. They have created a social widget for WordPress , which can help your users easily “like” your content and be treated to a round of advertising (if you desire to show advertising, of course). 4) never show ads and enjoy only the floating social widget for WordPress. How to earn money with Sharexy.com?Sharexy.com requires its users to create an account on their site and to fill in your PayPal address in order to receive cash rewards. The registration is totally free and doesn’t take more than five minutes to accomplish. The revenue split between you and the owners is 75/25, which means you can most of the money for clicks on your site. This plugin looks like a good method to earn additional revenue for WordPress blog owners. You can enjoy both the ability to let the readers spread the word about your content on social network via one click and get additional advertising revenue from your blog. 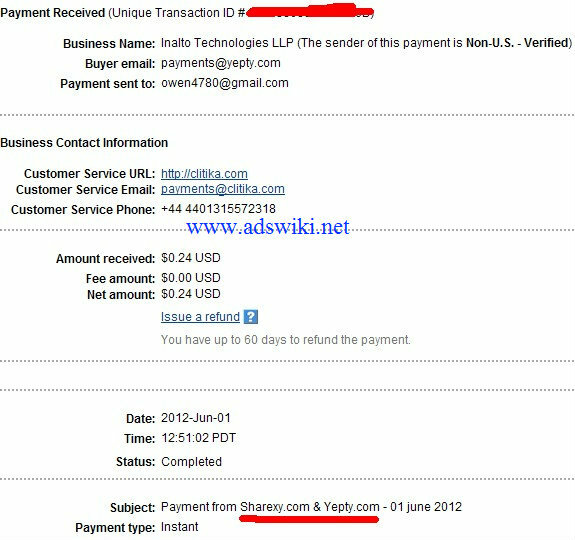 I received payment from their sister company Yepty.com.